The link provided is an picture taken from a phone. This picture was taken of a nurses viewing monitor. On the monitor, this black figure appeared standing on top of the patient who was lying in the bed. I have presented the facts as they were told to me. Some paranormal sites speculated that the mysterious figure on top of the bed was a mythological being known as a "mare." 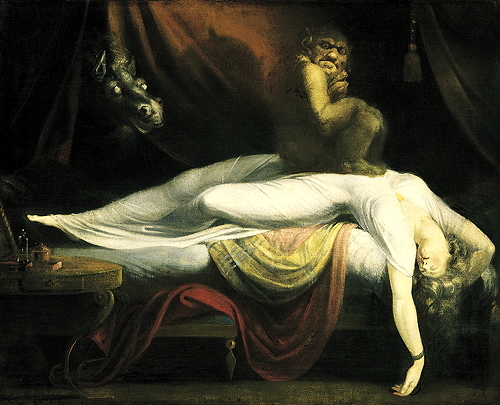 Wikipedia defines a mare as "an evil spirit or goblin in Germanic folklore which rides on people's chests while they sleep, bringing on bad dreams (or 'nightmares'). The mare is often similar to the mythical creatures succubus and incubus, and was likely inspired by sleep paralysis." So does the image really show a demon or a mare standing on top of a patient in a hospital bed? Of course, some choose to believe that, but as early as Dec 2013 a non-paranormal explanation had been offered, which is that the image is really just an interesting example of pareidolia. 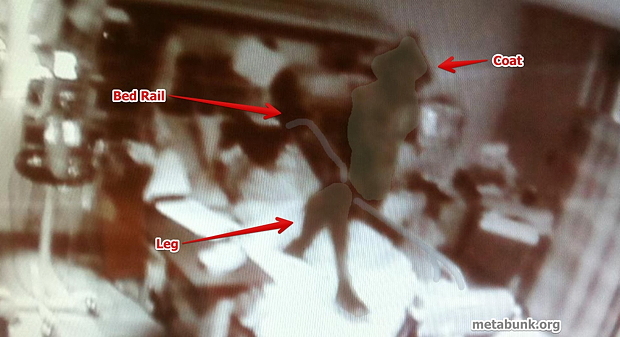 Various objects in the room (including the patient's legs, the rail of the bed, a coat, and a piece of hospital equipment) are positioned in such a way that, given the blurriness of the image, they combine to look like a "demon." The patient's own legs form the bottom of the demon's legs. The bed rail forms the top of the demon's legs. A piece of equipment on the wall makes up the body of the creature. And what appears to be the top of a coat hanging on a coat rack forms the head of the creature. That cant be real it is so fake look at the proof before you post man.